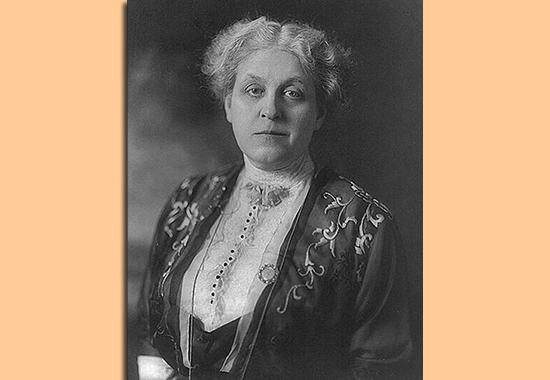 Carrie Chapman Catt was born Carrie Lane on January 9, 1859, in Ripon, Wisconsin. In 1884, she married Leo Chapman, who died in 1886. In 1890, she married George W. Catt, who died in 1905. In 1916, Carrie Chapman Catt gave her famous speech The Crisis at the NAWSA Emergency Convention, held from September 4 to 10 at Atlantic City, New Jersey. NAWSA stands for National American Woman Suffrage Association, a group formed in 1890. Susan B. Anthony was NAWSA's first president. When Anthony, 80 years old, retired in 1900, Carrie Chapman Catt became the organization's next president. At NAWSA's annual convention, held at Polis Theater in Washington D.C. from December 12 to 15, 1917, Catt delivered an open speech to Congress, let's call it her Onward and Upward speech. Catt's term as NAWSA's president was a crowned success when the House voted to approve the Susan B. Anthony Amendment to the U.S. Constitution, giving women the right to vote, on May 21, 1919. On August 18, 1920, the suffrage amendment was ratified by the State of Tennessee. This made Tennessee the 36th state to ratify the agreement, and it gave the agreement the necessary three-fourth of the states. On August 26, 1920, the 43rd Secretary of State, Bainbridge Colby, certified the ratification and proclaimed the Nineteenth Amendment to the U.S. Constitution, extending the vote to women.